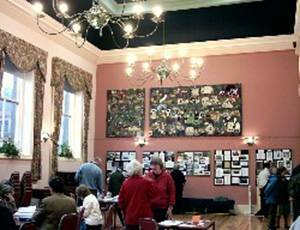 Undoubtedly, the Group’s biggest project was the Exhibition in October, “To Celebrate 150 Years of Stokesley and its Town Hall”. The Exhibition was such a success that it was extended all through the following week. The total number of visitors was 1349 coming from far and wide, with a profit of £510.90. Although it was very hard work, visitors’ comments - ‘thoroughly enjoyable’, ‘very professional’ and ‘excellent displays’ - made it all worthwhile. The organisers would like to thank everyone in Stokesley who kindly contributed family treasures, photographs, memorabilia etc and brought their family and friends to see the displays. Agriculture, Show and Fair, Levenside Floods. People at Play. Work and Sport. Railway Stations, Stokesley and District. Stokesley Buildings, Magazines and Newspapers, Invoices, Postcards, Printers, Schools, Street Scenes. Tanton Hall’s History and its residents. Stokesley 1919 Estate Sale Particulars. ‘From Stokesley Town. A Garland of Verses’.